Our Products >> COLLECTIBLE AMMO, Current & Obsolete, All Countries. >> SINGLE Collectible Cartridges, Currect & Obsolete, All Countries >> RIFLE Calibers: Single Cartridges, All Countries >> Inch Cal., Rifle Singles, Current & Obsolete >> .120" to .299" Calibers, single cartridges >> .17 Remington, Single Cartridges >> .17 Remington by Remington, JHP, One Cartridge not a Box! One Cartridge, not a box: .17 Remington factory loaded by Remington using new Remington Brass with “R-P 17 REM” Head-Stamp and loaded with a 25 grain .17" caliber JHP (Jacketed Hollow Point) projectile. The .17 Remington, was introduced by Remington in 1971 by necking down the 223 Remington or (5.56x45NATO) from .22" caliber to .17" caliber to accept .17" projectiles. It send projectiles down therange at over 4,000 feet per second and is a great varmint cartridge. This cartridge started the popularity of the .17 cal generation including: .17 Remington Fireball, .17 Hornet, .17 HMR R.F., .17 Mach2 R.F. , .17 Aquila and most like many more wildcats. 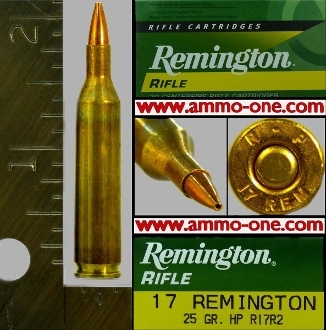 .17 Remington by Remington, JHP, One Cartridge not a Box!